2010 ADA Standard .216.2, [Signs] Designations, states, “Interior and exterior signs identifying permanent rooms and spaces shall comply with [Standards] 703.1, 703.2, and 703.5. Where pictograms are provided as designations of permanent interior rooms and spaces, the pictograms shall comply with [Standard] 703.6 and shall have text descriptors complying with [Standards] 703.2 and 703.5.” Standard 703.6.2, [Pictogram] Finish and Contrast, states, “Pictograms and their field shall have a non-glare finish. 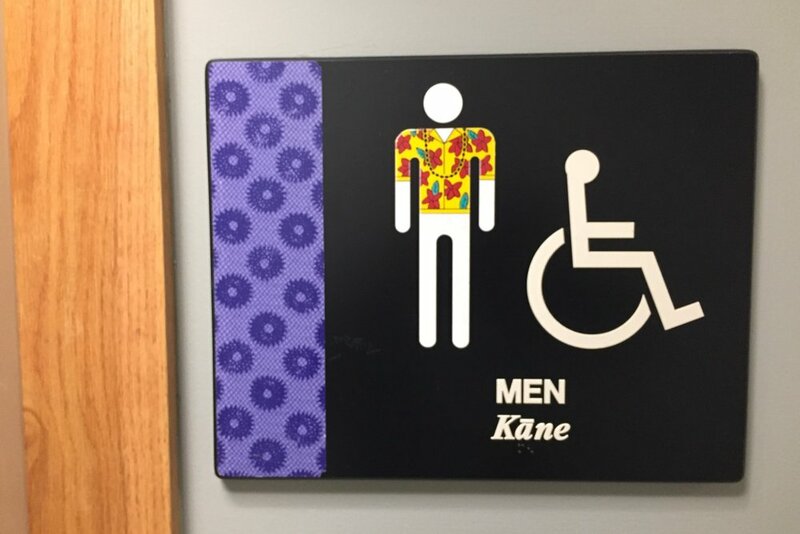 Pictograms shall contrast with their field with either a light pictogram on a dark field or a dark pictogram on a light field.” See the sign below for the Women’s Toilet Room where the female pictogram is wearing a Hawaiian print muumuu dress, lei around her neck, and a flower in her “hair”.